On their fifth album, Wham! Bang! Pow! 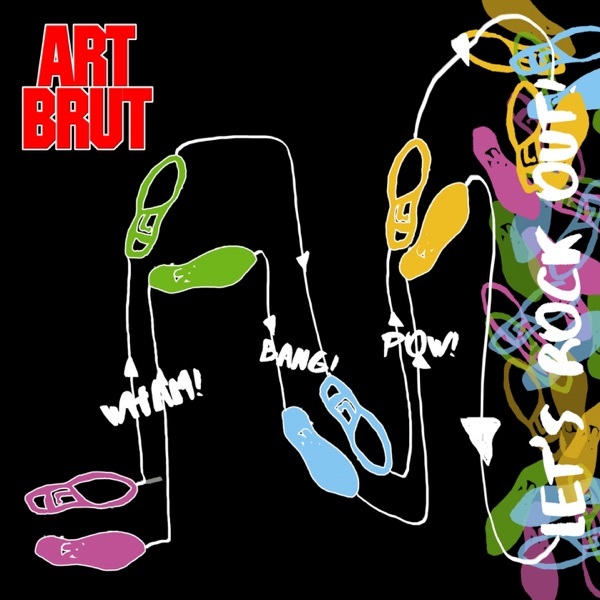 Let's Rock Out!, post punk band Art Brut continues to rise and fall on the strength of singer Eddie Argos's self-deprecating lyrics. Working in the tradition of Jonathan Richman and The Modern Lovers, Argos speak-sings self aware songs full of music nerd references about his own modest music career. Jim and Greg were both huge fans of their 2005 debut album Bang Bang Rock & Roll, but their follow up albums never improved on that album's formula. Greg doesn't find much new on Wham! Bang!… other than some horn arrangements, but declares his undying love for Eddie Argos' persona. Jim, however, finds the new album interesting for turning to a new category of rock cliches to subvert. Instead of“a poor schlub who wants to be in a band but has no talent,”Argos now depicts a sadder figure:“a poor middle-aged schlub who was in a band, but has no talent.”He finds it sadder and more effective than ever.